Mandarins are small citrus trees that can tolerate drought and are more weather resistant than the fruit, which is easily damaged by the cold. 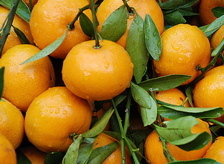 The fruit looks similar to an orange but is smaller and rich in vitamin C. Mandarins are sometimes marketed as tangerines, but this is a variety name (referring to the city of Tangiers, Morocco), not a botanical distinction. In the processing industry, oil is extracted from mandarin peel for use in candy, ice cream, and baked goods. Canned mandarin orange segments are produced by using heat and lye to remove the membranes before canning. While most often enjoyed whole or as a sweet addition to salads, mandarins can be juiced or used in preserves, and zest can give an unexpected twist to savory meals. Mandarins stored in the refrigerator will stay good for about seven days.